I don't like brown inks. It's been documented right here on this blog. Pilot Iroshizuku's Tsukushi? Too much red. Delta Brown, what's the flower you have on? It's brown. Chocolat from Private Reserve? I said I liked it, but I don't. I never bought a bottle like I said I might. I don't like brown inks. Really, I don't!! Why try again? Well, I have just about every other color group represented in my currently-inked pens and the Kaweco Sport I wanted to use is blue. I've always thought brown and blue look great together. Leather and denim, right? Can't just be me. I'm a convert. I have seen the light brown and I like it. I love it. My gosh, look at that shading. The color is wonderful. Not too dark, not too light. I'm not seeing any of that red that turned me away from some of the other browns I've tried. There's definitely some yellow in there, though. It writes fantastically. No flow issues (consider that I was using a BB nib). Dry time was a little long (that nib was laying down some serious ink). There was no feathering, bleeding, or ghosting with Clairefontaine paper. There was all of the above when I touched the nib to some cheapie cheap-o paper. I don't know if that's more because of the paper or the ink, but there you go. I'm adding Lie de The to my inky wish list. Here's the full review. Click here to see the full-size image (it's big). OK...speak up....brown ink. Are you in or out? Do you like browns that lean toward the yellow or more toward red? P.S. I rarely look at other reviews before I write my own, but will sometimes check them out after. There are lots of reviews on Fountain Pen Network that talk about how green Lie de The is. I don't see that. I don't see that so much that I wonder if the formulation has changed. When I look at the swabs on both Goulet Pens and Zeller Writing, I don't see green. Do you? Brown is just .... brown. But Lie de The really has caught my eye. I'll try others - there must be at least a couple of pretty ones out there! I've never tried Brown, but now I think I will! 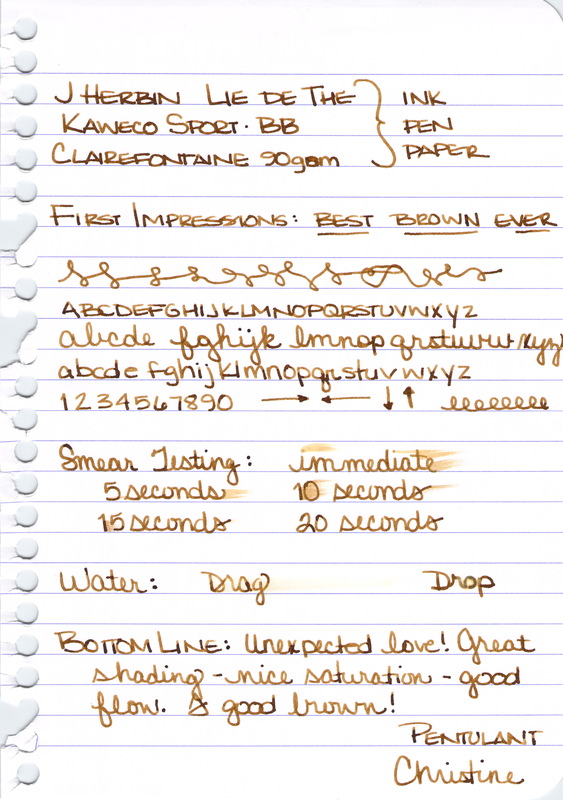 Have you tried Noodler's Golden Brown? It has a wonderful shading as well! I have never tried brown... but like you say... blue and brown looks good... and I think yellow and brown looks good too... thanks for the review!! your blog is great!! I'm really enjoying it!!! thank you!!! It looks good. I think you've convinced me sufficiently to add this to my wishlist.